Welcome back to my blog; I just recently returned from my trip to New York City, and had to share some moments with you all. If you all have the chance to travel to New York..DO IT! It is truly one of a kind, and there is so much to do. Not to mention, there is inspiration EVERYWHERE you go. From downtown Manhattan, to Brooklyn, to even the thrill of riding the subway; however it is that you spend your time in NYC, it will always be memorable. I feel that it is best to go during the Summer time; the weather is perfect, not too hot or cold; which makes everything more enjoyable. I was able to go to some of my favorites spots and visited some new ones. I'm highlighting the spots that I know are worth going to, and some that you should just save your money. 9/11 Memorial ("Ground Zero") : I always love coming here. Although the meaning behind the water fountains are sad; they are really beautiful. They also have a museum of memoriabilia from 9/11 for around $24. I didn't get a chance to go inside, but I'm not sure that I would've wanted to. Times Square: Now what kind of person would I be if I do not mention the iconic Times Square..LOL ! :) I've been here countless times, but it never gets old. I literally feel like I'm on a movie set sometimes because of how everything is overly exaggerated (in a good way, of course!). By that I mean, the advertisements everywhere, the restaurants, the entertainment. Definitely a place to visit while in New York City; Best way to go is by subway I'd say; and stay on the 42nd street stop. Going in Taxi or a car is just a nightmare; there's never parking, or if there is; it's really expensive. The New York Public Library: It is absolutely beautiful inside! I enjoy coming here to relax for a bit after walking around so much haha. I'd say it's one of the spots some over-look. I think it's definitely a New York landmark. Grand Central Station: Another location that I feel that is sometimes overlooked but it is so worth going to. 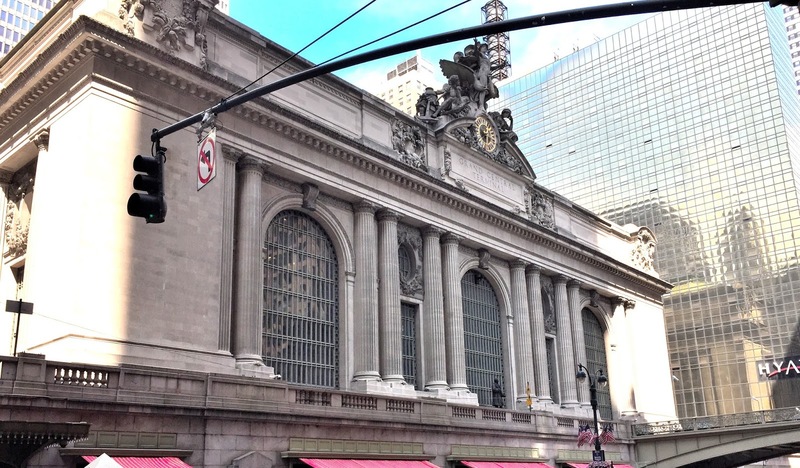 Not only can you take the subway to countless destinations, it offers places to eat and light shopping; it even has a huge Apple store! Its also gorgeous to take photos. Central Park: My favorite place in all of New York! Where else can you find such a grand park in such an enormous and busy city?!? It's magical. I love coming here to people watch or to catch a quick bite to eat around the food trucks that they have around the park. It is also where you could catch a ride on a horse carriage! If you guys are familiar with the "Met ball" that happens every year at this museum. It is where all the celebrities show up dressed up inspired by the yearly theme. This year was "China through the looking glass". They have a separate exhibit here of Chinese culture designed by some of the most well-known fashion designrs. Think Yves Saint Laurent, Alexander McQueen, and Valentino just to name a few! I really hope you enjoyed this post and that it helped you plan your next trip to New York City. It's a place that you hear so much about, but somtimes its inexplainable because you just have to go and experience it for yourself.